The municipal government of Edgewood Borough is comprised of an elected Mayor and seven person Council. 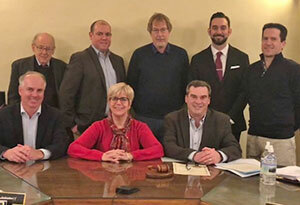 Committees provide guidance and oversight of Edgewood Borough’s various departments, with the Borough Manager’s office having responsibility for day to day administration of borough duties. Edgewood's Mayor is elected at large and holds office for a term of four years. The Mayor is the Chief Executive Officer of the Police Department and in the event of a tie in Council voting, casts the deciding vote. The Mayor has veto power over legislation passed by Council, although Borough Council may over-ride a veto by a majority vote plus one additional vote. Edgewood's Borough Council is made up of seven elected members, with each member serving a four year term. Council elections are held in November of each odd year with newly elected officials sworn in the following January. Learn more about Edgewood's current Council Members on our Committees page.